Why Don’t I see the Upsell/Success Messages in the Cart? Why Don't I see the Upsell/Success Messages in the Cart? Here are the most common reasons why you don’t see any success/upsell messages in the cart. You have no Active Campaigns. You have changed your theme and have not patched it after. You Are Running Entire Order Campaign. 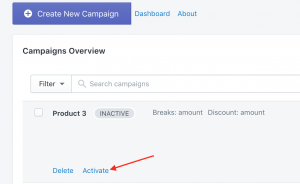 Once you’ve chosen to run 1 Entire Order campaign for any product in the cart we can’t determine the product to show the success/upsell messages for in the cart. The discount will apply for any product in the cart but w/o specific upsell/success messages displayed. Solution: Feel free to contact us by email: support@mamuta.com and we will help you to fix any issue within 24 hours.